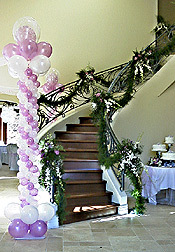 Balloons & Event Decor | Extravaganza! EXTRAVAGANZA! decorates for special occasions with custom balloon decor and centerpieces and can deliver balloons and gift baskets throughout the local area, including Peoria, Glendale, Sun City, Phoenix, Litchfield Park, Goodyear, Avondale, Sun City West. EXTRAVAGANZA! owner, Roberta (Bobbie) Rodgers was a member of the first professional balloon organization, NABA (National Association of Balloon Artists). She also became one of the first 200 people worldwide to earn her CBA (Certified Balloon Artist) credential, and is a charter member of the Qualatex Balloon Network. She has helped many beginning balloon decorators and gift basket professionals learn basic skills through classes at community colleges, and is very proud of winning a professional balloon sculpture competition with help from her students.